The more the merrier – .CLUB Startup NETWORKS and helps support .CLUB Startups. 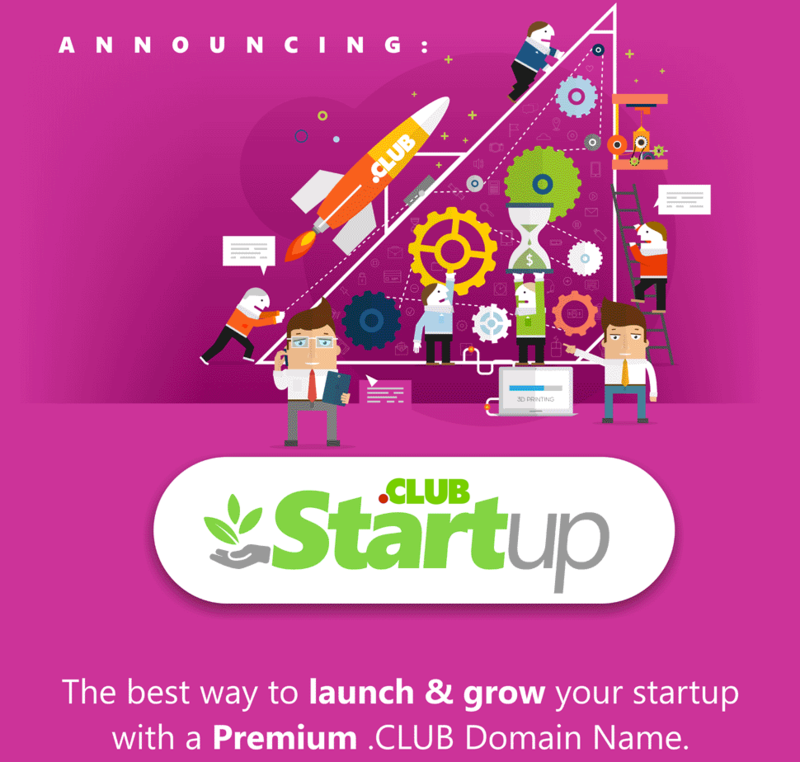 If you are looking to build your business around a great domain name that is meaningful and easy to remember, .CLUB Startup has the answer: qualify for the .CLUB Startup program and you can get a high value premium .CLUB domain name for 10 easy payments over 10 years, interest free! Already have a great .CLUB name for your business? You can still benefit from marketing and PR support as a .CLUB Startup member. In today’s social world, everyone is connected and every business needs to build a community around its customers and prospects. Passionate fans are the best salesforce any business could have, and that’s just one of the many reasons a .CLUB domain name is ideal for entrepreneurs. Is customer loyalty important to you? Does your business idea involve memberships or subscriptions? Do you want a domain name that immediately conveys a community around your product or service? .CLUB says it all. Looking for a Category Killer name? Let us know the premium .CLUB domain name you are interested in. Let us know a bit about the plans you have for your business that will use a .CLUB name as the primary web address. What’s in a [GREAT] name? If you’ve already obtained a great .CLUB name for your business you can still be a part of .CLUB Startup program and have access to benefits. If you’re looking for a Category Killer Premium name you may qualify for a special .CLUB Startup program payment plan. For example, if CategoryKiller.club is listed for $40,000, you’d be able to obtain the name and start using it for your business for $4,000/year for 10 years. After that the name is yours for as long as you continue to renew it at standard general availability pricing (currently approx. $15.00/year). Premium name listed prices are available upon request using the form below. Approved members of the .CLUB Startup program will automatically be considered part of the .CLUB Founders.club program, entitling them to participate in additional marketing, PR and promotional opportunities surrounding .CLUB domains. Founders.club companies are regularly mentioned in .CLUB advertisements and press releases and are featured by .CLUB in blog posts and on social media. *.CLUB Startup program payment plans are only available for Premium Domain Names priced at $20,000 or higher. Let us know the name you’re interested in and we’ll provide the list price.